Levi was born two months ago. He is growing, changing, and learning so much. I love listening to his noises. He is so vocal and expressive. Everyday he seems to be doing new things. For the most part, Levi does great sleeping through the night. Occasionally he stays up way too late and has a rough night, but usually he goes to sleep by 11:30 and sleeps for six straight hours. Then he wakes to feed and goes back to sleep for about three hours. He also tends to take a long nap from 3-4:30, give or take a half hour either way. The sleep at night along with his long nap has allowed for me to stay mostly well rested, and our house to stay fairly clean. 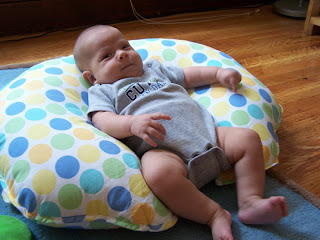 He now rolls over very often from his stomach to his back. I am amazed at how strong he is. Sometimes he gets fussy when we are holding him because he would rather be standing. He can fully support his own weight- just needs our help to balance. 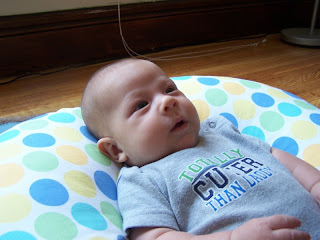 He can completely hold his head on his own (has been able to for a while). His smile is priceless. It is the most beautiful smile. When he is really happy he smiles with his whole face. He has let out a few giggles, but has yet to fully laugh. I am sure it will be a wonderful sound that I will cherish. 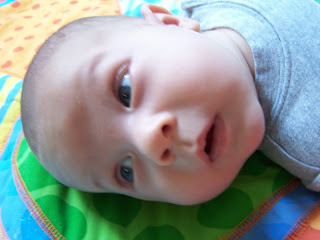 He is cooing and making all sorts of noises, mixing some consonants in with his vowels. When he is "talking" to us he will say "ahh goooo" a lot. He will mimic, or attempt to mimic, the faces I make. 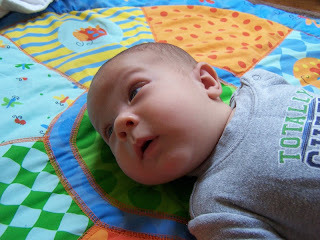 He loves reading time and playing on his activity mat. When I put him down to play, he will talk to his toys and loves to watch them move. When he is content and I read to him he is interested by the pages and likes to look at the book. When we go out for adventures, he loves to take in his surroundings. My baby is wonderful and has fully captured my heart. When he hurts I hurt, when he's happy I'm happy. 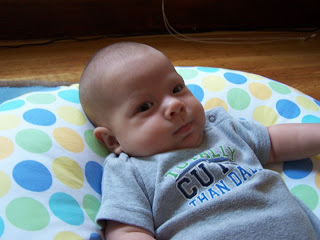 He is perfect in every way and I am so lucky I am his mother. I get to watch this boy grow into a man. I get to see him change daily, encourage him when he tackles new challenges, celebrate when he succeeds, and support him when he fails. That makes me very happy.